Christmas S.O.C.C.E.R. Team : Kathie Hill Music, LLC, Making music with and for kids for over 25 years! 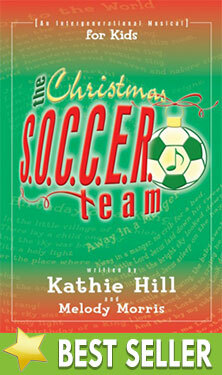 You'll score big with The Christmas SOCCER Team, an intergenerational musical by Kathie Hill and Melody Morris. When your kids arrive for a meeting of the Society of Christmas Carolers Emergency Rescue Team, they will learn the carols of our faith from the senior singers and share their own original Christmas songs with them. Jewel cased CD with spilt left channel instrumentation/right channel choral vocals and stereo instrumentation only for The Christmas SOCCER Team. (No dialogue or solos.). Downloadable pdf of all songs, script, production notes & piano transcription for Christmas SOCCER Team musical with permission to make 3 copies . Additional copies require purchase of additional 3x license/s. File is 139 pgs. Up to 200 downloadable PDF pages of lesson plans, kick-off ideas, Musical Activities, spiritual activities and production & organizational helps for The Christmas SOCCER Team. Downloadable orchestrations for 5 songs for brass & sax for The Christmas SOCCER Team.